An overview of key legal issues in injury cases after a car-pedestrian accident. It goes without saying that being hit by a car can be a traumatic experience. And in the chaotic aftermath that follows an accident, a lawsuit might be the furthest thing from your mind. But if the accident occurred because of someone else's negligence, and you've suffered injuries, you'll want to keep all your legal options open. In this article, we provide an overview of lawsuits brought by pedestrians against drivers -- focusing on the issues of fault, damages and the role that a lawyer might play in your case. Fault -- who is to blame for the accident -- is the first thing that a pedestrian should consider when deciding whether to file a lawsuit after being struck by a vehicle. Did the driver run a red light? Was the driver speeding? Was the driver intoxicated? Did the pedestrian wander out into traffic while texting? Could either person have avoided the accident? In most states, a pedestrian can only recover in a lawsuit against a driver when the accident was at least partially the driver’s fault. 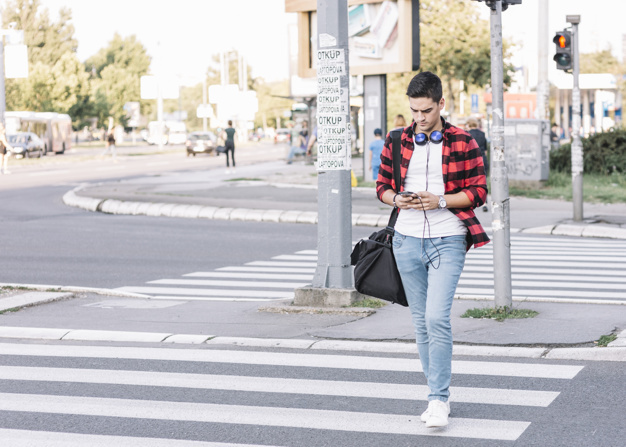 If the pedestrian literally wandered out into traffic while texting and there was nothing the driver could do to avoid contact, it is unlikely that the pedestrian would be successful in a lawsuit. Assuming that someone other than the pedestrian is at fault, it's also possible that more than one person might have caused a pedestrian accident. Imagine Driver A ran a red light. Driver B, who had a green light, had to swerve to avoid contact with Driver A’s vehicle. But the sudden swerve caused Driver B to lose control and hit Peggy, a pedestrian on the sidewalk. Under these circumstances, Peggy could sue Driver A, even though Driver A’s vehicle did not actually hit her. She would probably want to sue both drivers, since Driver B might share a portion of the fault for failing to control the vehicle after the swerve. But it is likely that Driver A, as the driver primarily at fault for the accident, would pay most of the damages. In a personal injury lawsuit, damages are meant to compensate the injured person for all harm that was suffered. There is a saying in law that damages are “meant to make a person whole again.” Obviously, it is difficult to equate money with injuries. But that is how the system works. The more simple categories of injury damages are medical expenses and lost wages. All medical expenses that the pedestrian paid as a result of the accident can usually be reimbursed as part of the damages in the lawsuit. Also, if the pedestrian missed work -- whether due to the injuries themselves or to receive treatment for the injuries -- the driver is usually on the hook for any lost income. The other two categories are trickier. How does one calculate the value of pain and suffering? That is really up to a jury. To give an extremely rough guide, if a pedestrian suffers some scrapes and bruises and a sore back for about a week, pain and suffering might be worth less than a thousand dollars. If the pedestrian suffers a broken hip, a broken collarbone, and a severe concussion, which leave the pedestrian with permanent severe headaches and permanent severe pain in the neck and shoulder area, pain and suffering might be worth hundreds of thousands. Loss of normal life or "loss of enjoyment" refers to the negative impact on the injured person’s life as a result of the accident. So, if an accident leaves a pedestrian paralyzed from the waist down, and the individual used to be an avid surfer and rock climber, these damages would be higher than if the injured person had spent little time outdoors and active even before the accident. “ Do I need a lawyer?” That question comes up quite often in injury cases. The answer is that it is possible for a pedestrian to handle a claim without a lawyer, especially if there are only minor injuries and fault is not in dispute. In other cases, it can be extremely difficult to go it on your own. Most lawyers offer free initial consultations, and in injury cases, you likely won't be charged up front. That's because most injury law firms and attorneys use contingency fee arrangements. The lawyer agrees to handle the case from start to finish in return for the injured person’s agreement that if the lawyer obtains a recovery, the lawyer gets a percentage of that recovery (commonly 33 percent or one-third).